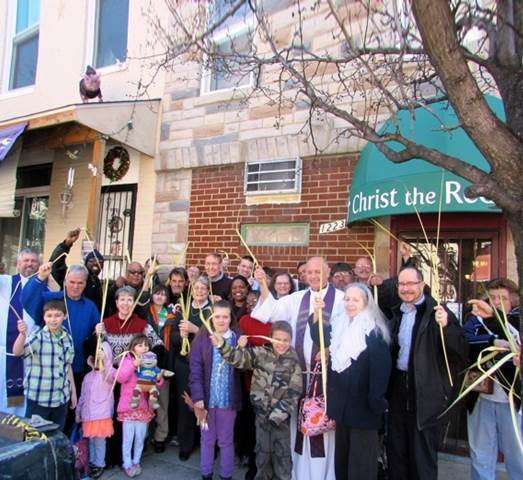 Palm Sunday at Christ the Redeemer Ministries in Baltimore, Maryland was a glorious celebration. Fr. Terry Murphy (on the right) and Fr. Jeff McFillin (on the left) lead this congregation. This ministry, through Church of the Good Shepherd in Catonsville, Maryland, under Bishop Michael Davidson, serves the urban neighborhood known as Pigtown. Poverty, substance abuse, and prostitution are just some of the daily issues facing the people of this neighborhood. But, with the help of the Holy Spirit, Christ the Redeemer works to bring the hope of Christ and His Gospel to those who live here. Our building was purchased a year ago with the help of the Foundation Day Fund. Visit our website at, ctrmbaltimore.com to learn more about us.